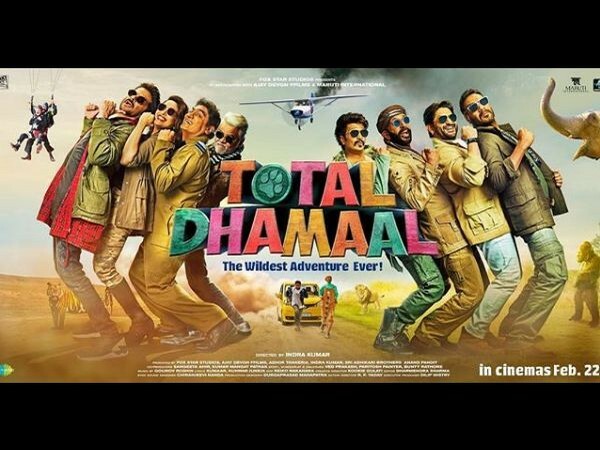 New Delhi [India], Mar 3 (ANI): The multi-starrer ‘Total Dhamaal’, despite opening to mixed response and being a non-holiday release, cruised past the Rs 100 crore mark in the second week of its release. New Delhi [India], Feb 25 (ANI): The multi-starrer ‘Total Dhamaal’, despite being a non-holiday release, witnessed a fantastic first weekend and earned Rs. 62. 40 in its opening weekend. Hyderabad (Telangana) [India], Feb 8 (ANI): In an endeavor to spread road safety awareness, Hyderabad Traffic Police has come up with an Initiative, namley 'My Auto is Safe'. Dehradun (Uttarakhand) [India], Jan 13 (ANI): The Income Tax department on Sunday said they found several discrepancies in the sales and inventory in most of the businesses run by BJP leader Anil Goyal in Dehradun. New Delhi [India], Dec 16 (ANI): India has welcomed the resolution of the political situation in Sri Lanka stated the Ministry of External Affairs (MEA) official Spokesperson. New Delhi [India], Nov 29 (ANI): After a gruelling contest, it was Haryana who came through as the champions of the 2018-19 BC Roy Junior National Championships (Tier II), beating Manipur by a slender 1-0 margin in the final at Railways Ground, Rajkot on Wednesday. New Delhi [India], Nov 22 (ANI): Delhi Deputy Chief Minister Manish Sisodia on Thursday announced that a special session of the Assembly will be held on Monday to discuss the alleged attack on Chief Minister Arvind Kejriwal and stand of the Centre and Delhi police in the matter. New Delhi [India], Nov 21 (ANI): The Delhi Police on Tuesday arrested the man who allegedly attacked Chief Minister Arvind Kejriwal with chilli powder. Kathmandu [Nepal], Sept 18 (ANI): Anil Kumar Jha, one of the Chairmen of the Rashtriya Janata Party-Nepal (RJP-N), is hopeful that the incumbent Nepal Communist Party-led government will address the demands made by his party regarding the rights of the Madhesi people. New Delhi [India], Sep 9 (ANI): One of the most versatile actors of the industry, Akshay Kumar turns 51 today. New Delhi [India], July 20 (ANI): Bollywood star Anil Kapoor has shared a quirky new number from his upcoming film 'Fanney Khan'.